While work is still a four letter word for many people, it’s encouraging to think that a simple mindfulness exercise that anyone can do at their workplace can rapidly help to reduce stress. So can mindfulness really help with stress at work? There’s a lot of people saying that it can and does, but perhaps not in the way that some might think. Rather than being something that is all hype and no substance, practicing mindfulness at work is not only good for you, it also has a flow on affect for your workmates, friends, family and loved ones. 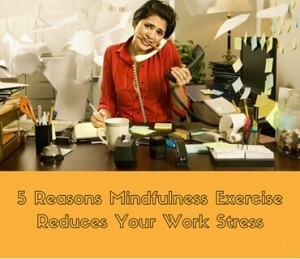 Let’s have a look then at 5 reasons why mindfulness meditation helps to reduce stress at work. When we’re under stress at work it’s so easy for the mind to get cluttered up by so many demands on your time and energy. From urgent matters that require your immediate attention, to never ending emails, meetings and deadlines. When our mind is not clear, we lose energy and focus. The result is that our performance drops and our work suffers. Just the simple act of clearing the mind using a mindful meditation breathing technique helps to quiet the mind and bring back your focus and energy so as to make the day flow smoother and with less effort. When we’re on the go from the moment we wake up until we collapse into bed at night after another long day at the office, even though we may be physically exhausted what really drains our energy levels is carrying tension in the body. We can use a simple progressive muscle relaxation exercise to help get rid of tension from the body so that we can relax and recharge our depleted energy levels. We can also use mindfulness at work to do a quick scan of our body to become aware of where we may be holding onto stress or tension. Once we become aware of it, then it’s easier to help let it go by doing something as simple as taking a 5 minute break, or perhaps just changing the way we are sitting or moving our body. Whether you’ve got important calls to make, meetings to attend to, sales to be made, or have an ocean of tasks to be dealt with, taking a few mindful moments through the day is a sure-fire way to get clear about what needs to be done and be more responsive with effective action. Just by meditating for a few minutes every now and then during the day will go a long way to helping you feel centered, relaxed and more focused. Many people often feel like they can handle even the most difficult of tasks or workloads much easier after meditating. It also helps to stay on task longer with less negative thoughts or feelings about the task. When we’re performing at a level that helps us to stay on top of our workload and keeps the bosses off our back that in itself helps to reduce work stress. The way mindfulness helps to do this is because it teaches you how to pay attention to what you are doing in the present moment. By learning to have more control and improve the quality of your attention, this means that not only do you benefit from it, so too will your co-workers. It may seem like a small thing but when you add up how much time and energy gets wasted by constant distractions, then it makes sense. There’s a few ways that mindfulness helps with relationships at work and at home. Firstly, it helps you to become a better listener. Rather than getting lost in your own thoughts, or thinking about what you are going to say while someone is talking to you, mindfulness helps you to be more present to any conversation. Secondly, a recent study from Harvard Medical School revealed that mindfulness meditation appears to make changes in regions of the brain that deal with self-awareness, empathy, and stress. This inner-attentiveness that comes from being mindful is essential to building effective and enjoyable relationships. Now that you have a better understanding of the 5 reasons why mindfulness meditation is a great idea at work, all that’s left is to put it into practice. One of the best habits to get into is a 10 or 20 minute meditation during your lunch break. Not only will that be a great way to clear your head and feel refreshed and ready to tackle the rest of your day with gusto, it’ll leave you feeling calm and centered for the rest of the day. At the very least take a 1 or 2-minute mindful break at your desk every hour or so by stopping, closing your eyes and just focusing your attention on your breath come in and out of the body. This will help you to stay focused in the moment, which is what being mindful is all about.